For over twenty-five years my parents worked as volunteer wildlife rehabbers. May is the time of year when the deer start having their fawns and is a month filled with memories of the dozens of orphaned or injured fawns that my parents bottle-fed, weaned, raised, and released. 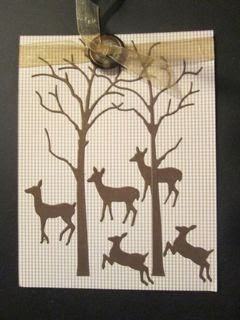 I like to think that some of the deer in our woods are descendants of those so lovingly cared for here. 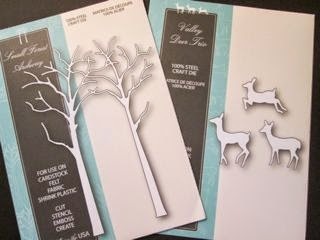 I used Memory Box Latte Gingham paper for the top-folded card and die cut a number of deer and placed them among the trees. I added a sheer ribbon and a button at the top. When I need a good guy card, I can reach for this one and stamp an appropriate sentiment inside!